“Edmonton is home to such an amazing variety of talent … the Edmonton Arts Council is just so pleased and proud to have supported that community for the better part of 20 years." At this point, he expects to paint three big murals, which will be the highlight of his show at the Nina Haggerty Centre from Sept. 19 to Oct. 10. Berger says his work will be a reflection on Canada’s 150th anniversary and the goal of reconciliation to the country’s Indigenous peoples. Berger, a Mi'kmaq from Canada’s East Coast, arrived in Edmonton 19 years ago at 15 years of age. He spent two weeks at Victoria Composite High School working on his art, but “got kicked out.” He pursued boxing, retiring from the ring at 28 years of age. For the past seven years, he has been painting. His studio is set up in his home on Edmonton’s north side. This funding is the opportunity that Berger has been waiting for. “I’m not going to let it go to waste. I’ve got the public eye now, so I’m going to make a really tremendous statement about what I can do,” he said. Berger was one of three Indigenous artists to recently receive funding from the Edmonton Arts Council. 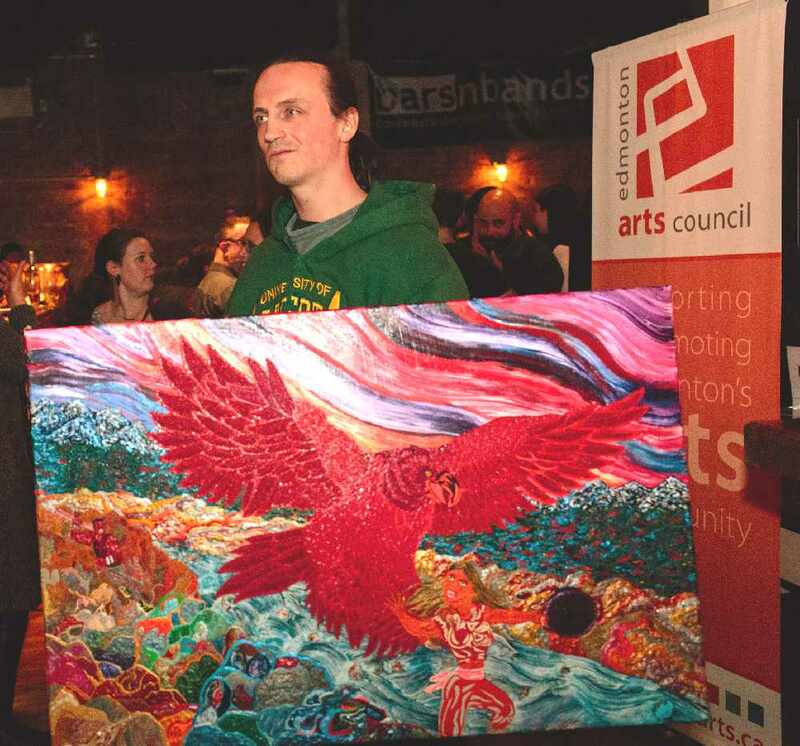 Dwayne Martineau, a musician, photographer, and visual artist was awarded $7,500 through the Edmonton Artists’ Trust Fund, a joint project of the arts council and the Edmonton Community Foundation. The Foundation is intended to invest in Edmonton’s creative community and to encourage artists to stay in the community. No specific project is required from the recipients other than the expectation that they will continue to work as an artist in Edmonton. Martineau’s recent artistic work has placed emphasis on the issues facing the Aboriginal community of Edmonton. Bill LeBlanc received $5,000 in the Cultural Diversity in the Arts project grant. LeBlanc, also known as Rellik, is using the money to create a music video for his song “The Hour (Mama’s Song),” which addresses the subject of losing a parent. Berger also received his funding as a Cultural Diversity in the Arts project grant.